So we have been back from a fabulous couple of weeks in Northern Queensland for a couple of weeks now. Cooler here in Melbourne but the warm glow of our time with lovely enthusiastic locals still lingers. 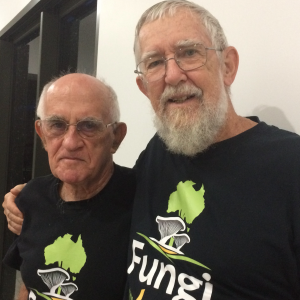 Sadly Dr Matt Barrett and Nigel Fechner were unable to join us this year but their efforts have helped to make the pocket guide as up-to-date as possible given the limited understanding of our Australian Tropical Fungi. 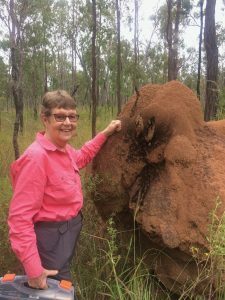 Others who shared their expertise during the Innisfail events were Dr Ceri Pearce (Fungal Pathologist) and Vivian Sandoval an entomologist, with a particular interest in the beetles that inhabit polypores. Last but not least was the generous support from many local hosts, and our own support crew of Bob Philpot (catering, driver and moral support), Gretchen Evans (amazing naturalist and scribe) and Barbara Thiers (botanist specialising in liverworts and all round naturalist). 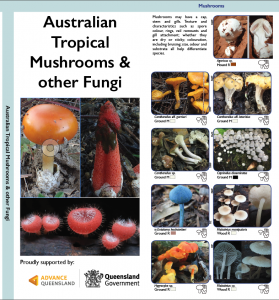 We hope this is the first of many publications that will help locals across the Tropics know more about their amazing diversity of fungi. 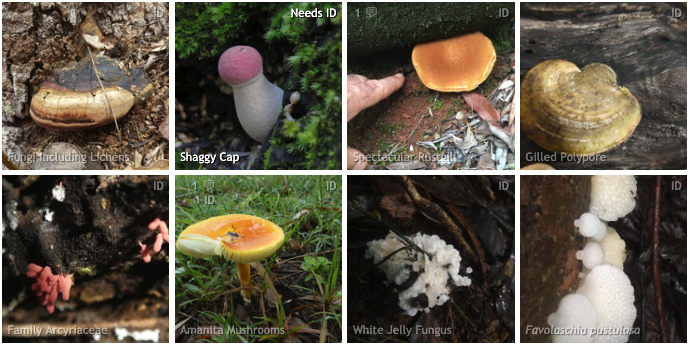 Identification materials are available for purchase in our Myco Shop. Fran Guard author and project coordinator home from the printers. 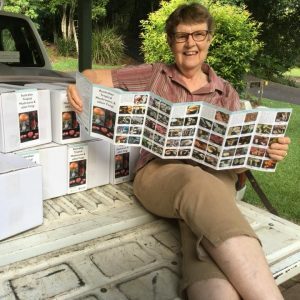 A great number of locals across different areas helped our team share the pocket guides and our passion for fungi with their communities. Other workshops were held at TREAT, Lake Eacham, Kuranda Envirocare and Cairns Botanic Gardens. Thanks to everyone who made our visit fun, fungi filled and productive! The dry conditions on the coast meant that we all had to search that much harder, and think a bit more about where we might find fungi and what cues to look for. 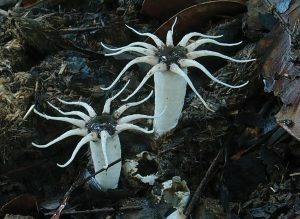 One of the highlights from workshops was the news that the rare, pure white Stinkhorn Aseroe arachnoidea was fruiting in peoples gardens. To us authors this was like hearing of sightings of rare birds like Gouldian Finches hanging out in peoples bird baths! Another highlight was a few days spent collecting fungi in the fabulous bushland of Yourka Reserve. 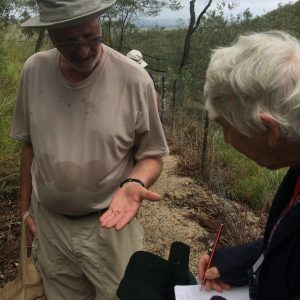 This wonderful property cared for by the tremendous managers Paul and Leeanne from Bush Heritage Australia, is a rich mosaic of over 30 examples of Einasleigh Upland vegetation types. These range from tall wet eucalypt forests to open Iron Bark and Lemon-scented Gum woodlands down to riparian lowland woodlands, with the occasional rocky gorge thrown in, and lots of creek crossings. Although the fungi were just starting to pop up, there was enough to keep our team of mycologists working past dark to record their diversity, and in fact we think we might have 2 new species, a Russula and an Austroboletus! 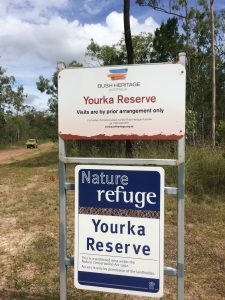 Yourka Reserve is a diversity hot spot. Fran and Termite Powderpuffs (Podaxis beringamensis) sheading their black spores. 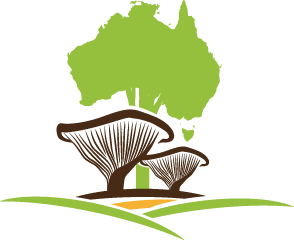 We encourage everyone living or visiting the Australian Tropics to share their fungi observations with our iNaturalist project. By sharing images and observations of Tropical Fungi we are able to follow the tropical fungi season vicariously. Getting to know the more common species, and in the long term, working together with locals to help get scientific names for all those currently unnamed fungi. Our iNaturalist project helped production of the pocket guide immensely, facilitating confirmation that some species really do occur in the tropics, and gave us a source of tropical images. The warm camaraderie of working together and discovering more about the our tropical bushlands and the fungi that inhabit them, will keep me warm and busy for months to come.